You'll be £25.00 closer to your next £10.00 credit when you purchase From Auster to Apache. What's this? This is the 70th Anniversary year of 656 Squadron, which first formed on 31st December 1942. Over the intervening years the Squadron has served with great distinction in India, Burma, Java, Malaya, Borneo, Hong Kong, the UK, the Falkland Islands, Bosnia, Kosovo and, most recently, in Afghanistan. This is 656's story, told in full and for the first time. 656 Squadron's story is a diverse one, characterized by active deployment in a diverse range of wartime theaters. It was the only Air Observation Post (AOP) squadron to serve with the “Forgotten Army”, 14th Army under General Sir Bill Slim in Burma and, after the successful conclusion of this campaign, the Squadron was posted to Malaya, from where it took part in the little known but fierce campaign countering separatists in Java. This was followed by the long campaign against Chinese communist terrorists in Malaya (Malayan Emergency). In addition, many members of the Squadron served in the Korean War. Subsequently there was considerable involvement in the “Confrontation” with Indonesia in Borneo and policing and internal security work in Hong Kong. Following its return to the UK in 1979, there were deployments on active service to Rhodesia, the Falkland Islands (both during and after the war) and Bosnia and Kosovo. In 2001 the Squadron was chosen to be the Army's first Apache Attack Helicopter Squadron, and has now undertaken three operational tours in Afghanistan. Overall it has amassed well over 200,000 operational flying hours making it the most operational squadron in the entire history of army air warfare. It was also, of course, most recently on active service as a sea-based strike unit over the skies of Libya. It is a quite remarkable fact that the Squadron, and indeed the British Army, have both come full circle; directing fire from the air in 1944, to being the artillery in the air, directed from the ground in 2011. Includes good quality photos that piece the text together. Interviews and quotes from those who took part livens up and gives colour to the narrative, making this an interesting read for anyone interested in Army aviation. No reader who is enthusiastic about aircraft will fail to be fascinated by the numerous anecdotal accounts of the wide range of unique experiences gained in flying Tiger Moth, Auster and DH Beaver fixed-wing types, Scout, Sioux, Gazelle, Lynx and Apache helicopters in a very wide variety of military roles and operational environments. Moreover, the book is testament to Guy's ability to quickly research and assimilate a huge amount of information and present it in a detailed but easily accessible way, thanks in part to an index which, in itself, must have taken immense patience to produce. Without doubt, the book is one of his greatest achievements to date and I know from personal contact it has given him great satisfaction to write. Highly commended. A comprehensive account. Illustrated to a very high standard. He interweaves historical fact with oral history. It brings his subjects to life, particularly when read from the professional soldier's viewpoint. It also adds colour to what could easily be a black and white report of days gone by. 'From Auster to Apache' captures 70 years in an Aviation squadron's vibrant life and tells us just how much has changed in the intervening years - and just how much has remained the same. This book is densely packed and may be read as an interesting story or mined for nuggets of useful information. It is a must for all who have served in 656 Squadron and highly recommended for those who have an interest in our history. For those that resist buying such books, 'borrow' the book and just quickly read General Sir John Learmont's foreward and then turn to Appendix 1, the list of honours and Awards, you will be quickly sold! Readers will quickly appreciate how much work has been involved in researching, collating and then ultimately writing such a detailed history. The Association is indebted to Guy for his dedication and professionalism in producing a book which does true justice to the squadron's unique history. 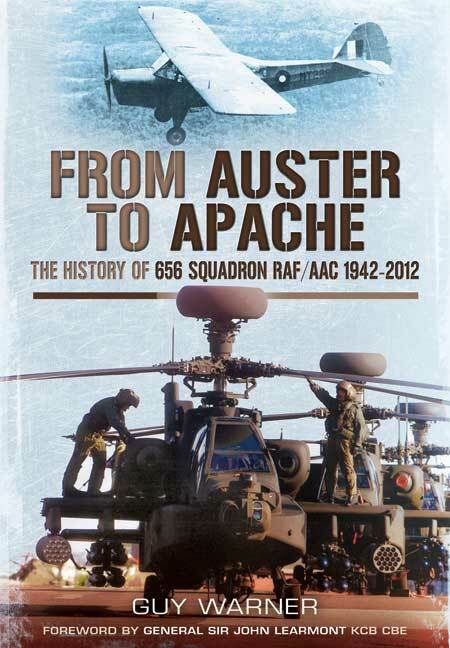 From Auster to Apache is a well-written account of a remarkable squadron. The book is a worthy addition to the annuals of the RAF. It was on 31 December 2012, that 656 squadron celebrated its 70th anniversary. Over the intervening years the squadron has served with great distinction in India, Burma, Java, Malaya, Borneo, Hong Kong, the UK, the Falkland Islands, Bosnia, Kosovo and, most recently, in Afghanistan. This is 656's story, told in full. An excellent selection of photographs and squadron memorabilia also enhances the quality of this well-written volume. The book is excellent, lots of contributions which add colour - Guy was on the ball in getting the gen from so many. All my local friends are queueing up to borrow it. The Army Air Corp's 656 Squadron is celebrating its 70th anniversary with a book telling its dramatic story and written by Ulster author Guy Warner who specialises in military affairs. It's a tribute to Guy that he was commissioned to write this important tome. Guy has just written a series of historical articles for the Fleet Air Arm in connection with FlyNavy 100, has previously written about naval aviation history in his books on 230 Squadron (which began life as a RNAS unit) and on RNAS Airships in WW1.